Thank you all for your sweet get well wishes, I am indeed much better and gearing up for tomorrows big event...meeting my fresh from God newborn granddaughter! I am so excited I can hardly contain myself! 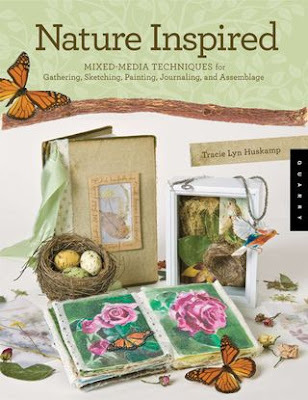 I wanted to share a hot off the press publication with you that I have been eagerly awaiting, Nature Inspired by Tracie Lyn Huskamp. This is a wonderful book that teaches Mixed-Media techniques for gathering, sketching, painting, journaling, and assemblage. Tracie has combined her teaching with a unique style that lets you explore nature through art. I love her combination of paper, paint, fabrics, and photos to make one of kind nature inspired works of art. Just look at these beautiful journals... In this book you will learn about capturing nature with photography, collecting assemblage items, artful techniques for making nature prints, sketching and painting from your photography, techniques for creating backgrounds for your artwork, as well as creating projects from all you learn. Some of the projects include nature journals, jewelry, and nature assemblage. You can visit Tracie's blog, The Red Door Studio, where you can learn more about her book and view some of her nature inspired art. If you would like to take a peek inside, visit Amazon here and click on the Look Inside This Book feature. The book is available through Tracie, Amazon, and Barnes & Noble. As you can see it is already on my work table ready to be put to use. A huge thank you and congratulations goes out to Tracie on the publication of her new book. I wish her much success! What a beautiful book! Thanks for the link and I hope you are feeling much better now! That is a beautiful book Sandy. Glad to hear you are feeling much better. I know you must be so excited to know your grand baby is coming tomorrow. Can't wait to see her picture. I am so happy to hear that you are feeling better. Thanks for your recommendation, I highly appreciate them. Have a great & fantastic day tomorrow, one that you'll never forget! Miss Sandy, I'm sorry you were ill. So glad you are feeling better. What an exciting time you will have seeing your precious little granddaughter. Congratulations on a new little granddaughter! Good thing you are feeling better ,but then nothing perks a gal up more than a new grandbaby! I'm glad to hear you're better, Miss Sandy! And so excited to hear about the birth of your new granddaughter! Get rid of that nasty virus so you can go love on her! This is a beautiful book. I'm not a paper artist, but I know how to recognize beautiful paper artistry when I see it. Ditto what Kathy B said - when is YOUR book coming out? Inquiring minds want to know! This book looks wonderful. I hope that I get to see it in person and who knows what I might have to do about that. I do know that it's going to be terribly easy to put books on my wish list for Christmas. Love the blue page! Thanks for sharing. I cannot wait to check this book out!!! It looks like a book to Love! So Glad you are feeling better! You have to let us know about your new grandaughter! Sandy, this is such a lovely post! Sorry to hear you were sick...and excited you have a new granddaughter! I was sorry to hear that you were under the weather and am ever so glad you are on the mend. Did you happen to create your blog free tag? I am also wishing to do this. I.m delighted to have found your beautiful blog. The new book is marvelous; as an artist I can appreciate the artistic beauty of the journal this lady has created, as we all can!.., CONGRATULATIONS on the birth of your, "FRESH FROM GOD", sweetie of a new little grand daugther. So glad you are feeling better so that you can enjoy her!.., I also wanted to say that I adore your artistically designeed banner!.., Cheers, and please do feel welcome to pop by to see me if you get the chance; I'm a link of a button away.., Blessings, Silken Purse. This defintitely looks like a wonderful book! Thanks for sharing! Oh, I had just one other blog to catch up on so I am glad I have not missed too much. Glad you are feeling much better.